Fascinating, incredible book. In her first novel, I must say that Tiffany McDaniel hits this one right out of the park. It reads like a classic with all of the quirks of Flannery O’Connor with a twist of Shirley Jackson to match. The story follows the eccentric Bliss family who live in the fictional small town of Breathed, Ohio. The year is 1984. Autopsy Bliss (I love their names! ), the patriarch of the family, writes an ad in the local paper inviting the devil into town. Several days later, a green eyed, 13-year-old black boy calling himself Sal (“the beginning of Satan and the first step into Lucifer, Sa-L”) appears to Fielding Bliss, the youngest of the family, claiming to be the devil himself. Although the book never explicitly confirms that Sal is who he claims to be, he certainly carries an air of mystery and wisdom far beyond his years, speaking in strange parables and telling lengthy stories about God, Heaven, and Hell. Despite his shocking proclamation, Sal is taken into the Bliss family’s home and the two boys become best friends. 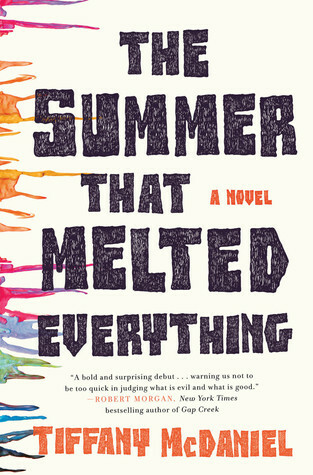 In the midst of a record heat wave, accidents begin to happen and the townspeople eventually come to blame Sal, the ‘devil’ who has come to live amongst them. I won’t tell you any more to avoid spoiling this novel, but I will say that it involves flashbacks, with Fielding telling us this story from 70 years into the future, the events of this particular time stealing his innocence and ultimately turning him into a broken, bitter man. The friendship between Sal and Fielding is the foundation of this novel, upon which a complicated, layered narrative is built. Even though the story is set in Ohio, there’s a strong hint of the southern Gothic element here. There’s also thought-provoking, well placed quotes from Milton’s Paradise Lost, along with powerful meditations on the meaning of family, racism, homophobia, religion, and mob mentality. I loved how this book never felt as if it were addressing some predetermined ‘checklist’ of issues, it just focused on the characters and the story in rich, beautiful language without being preachy or sounding false. I finished this book a few days ahead of schedule because I couldn’t stop reading it. There is a lot of emotion packed in here and the ending was just the tip of that iceberg. Just when I found myself thanking God I didn’t live in a small town in Ohio, I read this and contemplated its message (along with present day’s headlines) and realized that “normal” people become monsters everyday and that not much has changed. This novel functions as more of a modern parable, an old-fashioned morality tale that’s been updated for today’s day and age. I was emotionally exhausted after reading this, because it was THAT deep. The writing here hovers somewhere between fantasy and reality, so be prepared to suspend your disbelief. There’s a lot of thinking that comes with this book, so I will not say that this a novel for everyone. I do, however, wholeheartedly recommend that people read this, because you will definitely fall in love with it, like I did.